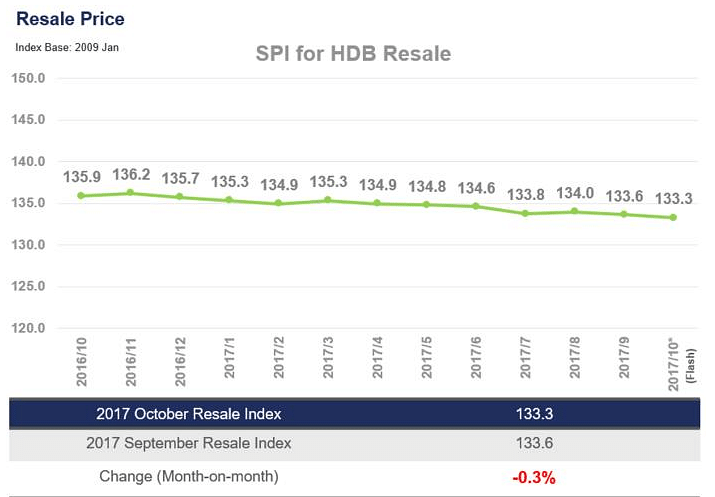 SINGAPORE - HDB resale prices dipped by 0.3 per cent in October from a month ago, the same decline seen in September, but sales volume recovered to post a 5.9 per cent increase, SRX Property flash estimates showed on Thursday (Nov 9). From a year ago, resale prices in October were 1.9 per cent lower, and 12.5 per cent below the peak in April 2013. Month on month, the resale prices of HDB 3-room and 5-room flats rose by 0.5 per cent and 0.2 per cent respectively, while 4-room remained the same and executive flats dropped by 0.9 per cent. Resale prices in mature estates reversed September's rise with an 0.8 per cent drop in October, while non-mature estates edged up by 0.1 per cent. 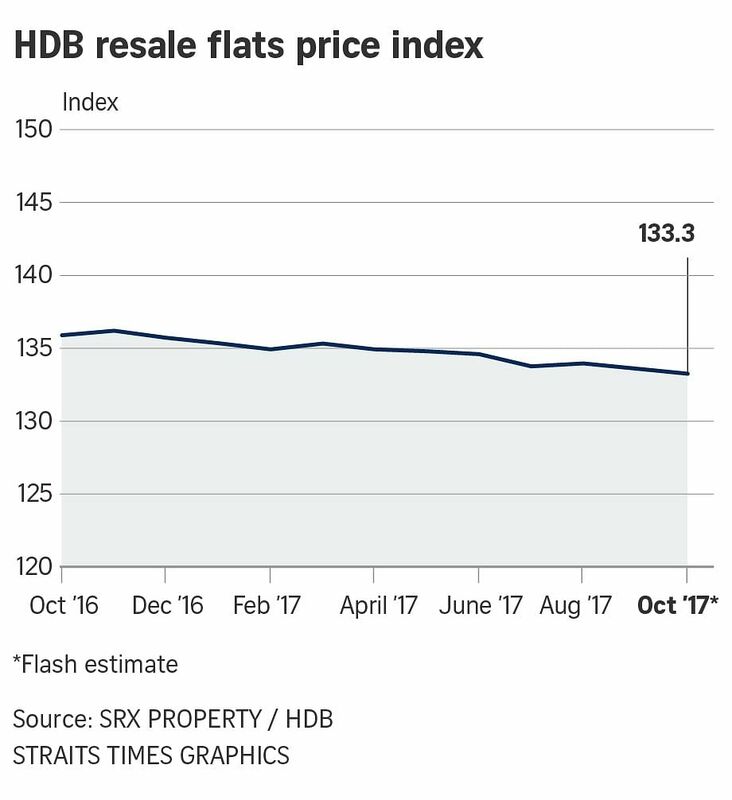 Based on SRX Property estimates of HDB resale transactions, about 1,781 HDB resale flats were sold in October, a 5.9 per cent increase from 1,681 units in the previous month. This was a swing from the 14 per cent month-on-month fall in sales seen in September. Year on year, resale volume has increased by 5.0 per cent compared to the 1,696 units resold in October 2016. But sales are down by 51.2 per cent compared to the peak of 3,649 units in May 2010. Bukit Timah posted the highest median Transaction Over X-Value (TOX) in March. TOX measures whether buyers are overpaying or underpaying SRX Property's computer-generated market value. For HDB towns having more than 10 resale transactions in October, Bukit Timah reported the highest median TOX of S$53,000 followed by Bukit Merah with S$5,500. This means that majority of the buyers in these towns purchased units above SRX's computer-generated market value. Bishan posted the most negative median TOX of S$22,000, followed by Marine Parade at S$9,000.